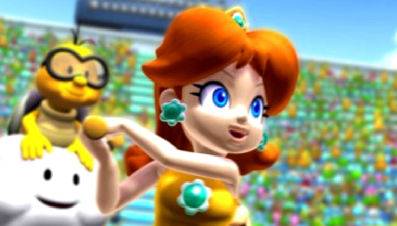 Princess Daisy is a character that appears throughout the Mario series of games, with her first appearance being in Super Mario Land in 1989. Gunpei Yokoi, her creator, mentioned that he wanted a plot similar to Super Mario Bros., but with a different setting, which led to Daisy being made. She is the princess of Sarasaland, which is a neighboring land to the Mushroom Kingdom. She looks similar to Princess Peach in basic appearance, although her hair is orange in color. Her signature colors are usually brown and yellow, and she is considered a tomboy who is highly competitive. Mario Golf: World Tour is the sixth game in the Mario Golf franchise developed by Camelot Software Planning and is set to be released on the Nintendo 3DS during 2014. Mario & Sonic at the Sochi 2014 Winter Olympic Games is a sports mini-game compilation that is developed by Sega Sports R&D and published by Nintendo, for the Nintendo Wii U. It is the fourth installment in the Mario & Sonic series, which combines Nintendo's popular Mario series with Sega's popular Sonic the Hedgehog series, and has their mascots compete in various Olympic events. Daisy first appeared in Super Mario Land in 1989, which was her only non-spinoff appearance in the Mario series. In it, she is kidnapped by Tatanga, who invades her land of Sarasaland and in the end, she is rescued by Mario.